To me, these five figures are all special because they are the only M.U.S.C.L.E. figures available in nine different colors: (1) Flesh; (2) Red; (3) Purple; (4) Dark Blue; (5) Light Blue; (6) Salmon; (7) Orange; (8) Green; and (9) Grape. 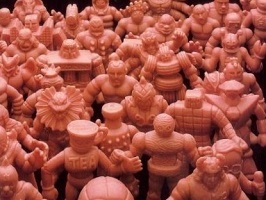 I didn’t discover this until collecting figures as an adult because the M.U.S.C.L.E. board game they came from wasn’t sold here in Australia. In fact, I didn’t even realize that the 10 board game figures were originally from a board game. The reason being is that the 10 figures were my first purchase as an adult collector. I paid $1 for the lot; only knowing that the color was different to figures I owned (of which none I kept were purple – see MMMM #54). Upon further research I then realized that the Purple version of each of the Grape figures is a Class A. Is that a coincidence? Even though Purple is the M.U.S.C.L.E. color I like least, I have owned all five of the Purple versions, thus having nine different colors of each figure. Today, I only have the #1 and #152 in all nine colors. I’m not attempting to influence the vote by naming my favorite (I might vote), but I’m curious as to what the community thinks is their favorite. I have seen varying amounts of sold items for the five Purple versions which gives me an idea of the most popular. So, in tribute to Star Wars Revenge of the Sith, I’m giving Order #66 on MMMM #66 – which Grape figure is your favorite? Please feel free to add reasons why in the comments! This entry was posted on Monday, January 25th, 2016 and is filed under UofM News. You can follow any responses to this entry through RSS 2.0. You can skip to the end and leave a response. Pinging is currently not allowed. I’ve always liked Screw Kid, and I think he looks great in grape. Although it’s close because #1 looks pretty sharp. I voted #1, but I was having voters remorse and thinking about #149 lol! #1 is an adult favorite of mine, but #149 is a childhood favorite. totally agree with Plasticfiend #149 as a kid, but #152 as an adult and #1 is def up on the list of top favorites.